Jakarta, 05/10/2016, the Aliansi Gerakan Reforma Agraria (AGRA) condemned the acts of violence by the join guards against the People of Dadap, Tangerang regency on May 10, 2016. Demolitions of houses and evictions of the poor families and fisher folk villages is more intensifies run by the central and local governments. Various pretexts of the government to evict the poor houses and the fisher folk village are just a mere boasting. The reasons for the urban spatial planning, green areas, state-owned land, until the reclamation, when thus all is just pretexts to evict and grab the people’s rights to housing, livelihoods and even access to works in support of their survival and defense of life, especially in urban areas that continue to peddled to the investors, as a free area that is ready to be operated. The Government’s policies that serve the interests of investors and the expensed of the people must be stopped, because this policy is increasingly driven down people’s livelihood as a result of deprivation and exploitations of livelihoods resources, including in this case, is the thousands of families of fishermen in coastal areas of Dadap whom are live and depending life to the sea. They are in danger and threatened of left homeless and source of livelihood, as a result of evictions by the Government which has been planned since last year. The reason of the government to closed of the brothels, the urban spatial plan, to create the open green space is the classic reason that is always used when conducting the evictions, and proved all that behind of the evictions is only for business interests of investors, including the eviction case in Dadap which the plan of it managements will be transferred to PT. Agung Sedayu Group. Rahmat Ajiguna (Katua general AGRA), said that the clashes between of Dadap People whom refused the eviction with the combined forces of the Civil Service Police, National police of Indonesia, and the military on this day, which resulted in 5 people gunshot wounds was the evidence that the government continues to put forward of violence as the ways to impose their policies. It is, at the same time shows the fascist character of government today. 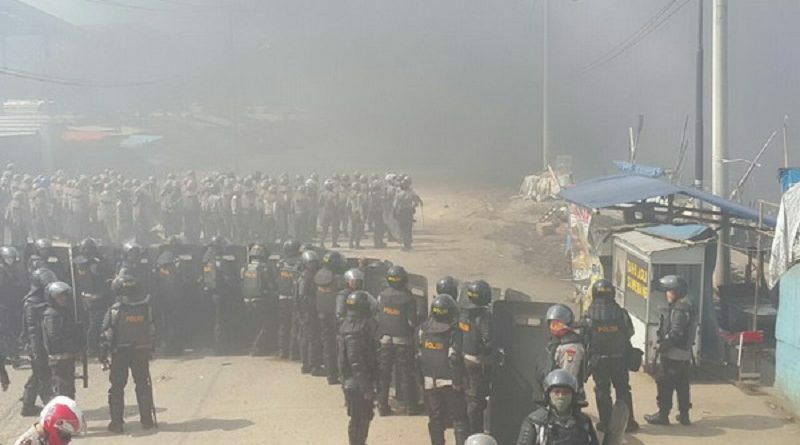 The evictions in urban and land grabbing in the rural occurred more massive conducted by Jokowi-JK government, because of his compliance to serve the foreign investors in Indonesia. In rural, infrastructure projects, the construction of dams, roads, railroads, which entirely grabbed the land of the people also just to accelerate the flow of goods and raw materials the spoils of Indonesia’s natural resources, both the plantations and the results of the large-scale of mining to be brought to the assembling and processing industries, even to the land of the Investors. And this all is the implementation of the economic policy packages volumes I-XII of Jokowi-JK government. Therefore, on behalf of the Aliansi Gerakan Reforma Agraria (AGRA), Rahmat claimed salute and support to the people of Dadap whom are keep the spirit and consistently maintain their place of residence and sources of life. We also invite to all parties to provide the supports and solidarities, both politic and economic such as foods, and any assistances for the people of Dadap to survive in their struggle for their place of residence and and livelihood. We also appeal to all evictees and the whole movement in order to strengthen the unity among the people against the government policies that only serve the investor and caused the miseries to the people. We are demanding to Jokowi-JK government in order to stop the land grabbing and provide the political freedom for the people to fight for the economic, political and improvement of livelihood.